Blood transfusion is the process of transferring blood from one person's body to another. A severely injured person or one undergoing surgery may need extra blood to replace that which has been lost. If the extra blood is not available, the person can go into shock and die. Folk medicine and ancient practice long considered blood to have beneficial, healing properties. Perhaps the earliest recorded case of blood transfusion was that of Pope Innocent VIII (1432-1492). The Pope was transfused in April 1492 with the blood of three young boys. The outcome indicates why transfusion attempts were rare and dangerous: all three boys died. After William Harvey (1578-1657) explained the mechanism of blood circulation in 1628, interest in transfusion grew. An Italian physician, Giovanni Colle, gave the first concise description of a blood transfusion in 1628. An English clergyman, Francis Potter, seems to have experimented with transfusions in the 1650s. In the 1660s, the Royal Society of London (England) sponsored a series of transfusion trials. This was after Sir Christopher Wren (1632-1723), the famous architect, used a quill-and-bladder syringe to inject fluid into the vein of a dog. The injection was done to demonstrate a new method of administering medications. Richard Lower (1631-1691) continued the experiments at Oxford University in England and performed the first direct blood transfusion from one dog to another in 1665 by connecting an artery to a vein via a silver tube. French physician, Jean Baptiste Denis (1643-1704), used Lower's technique in June of 1667 to perform a transfusion from a lamb to an ill human. Several months later, both Denis and Lower transfused blood from a sheep to a man. The promising new technique was abruptly halted in 1668 when one of Denis's transfused patients died. Even though the cause of death was poisoning by the patient's wife, transfusions were banned in France and did not become medically established in England. In 1818 James Blundell, a physician at Guy's Hospital in London, revived the practice of transfusion by using a syringe to inject blood from human donors. At first Blundell transfused only hopeless cases, but in 1829 he used blood transfusion successfully to treat a woman with postpartum hemorrhage. Both Blundell and James N. Aveling improved the apparatus for carrying out transfusions. The technique was widely used during the Franco-Prussian War (1870-1871). Perhaps most serious of the remaining risks of blood transfusion is the possibility of transmitting disease via the donor's blood. Of special concern is the transmittal of the HIV virus and hepatitis. 1907. Transfusion reaction was more fully overcome in 1940 when Landsteiner and Walter Weiner (1899-) discovered the Rhesus factor ( Rh factor ), which typically causes the antigen/antibody reaction. At first, blood transfusion was done via direct connection between donor and recipient. George Washington Crile (1864-1943), an American surgeon, developed a standard surgical method of blood transfusion. After surgically exposing a recipient's vein and a donor's artery, a physician clamped shut the vessels and attached a small tube as a conduit between them. When the surgical clamps clamps were opened, blood flowed from donor to recipient. Edward Lindeman took the procedure out of the operating room in 1913 with a simple needle puncture technique. This method also allowed exact measurement of the amounts of blood being transfused. With all these advances in place, blood transfusion spread rapidly and became firmly established during World War I (1914-1918). Once blood transfusion was in wide use, storage of donated blood became a problem. The first "blood bank" was set up by Dr. Bernard Fantus in 1937 at Cook County Hospital in Chicago, Illinois. 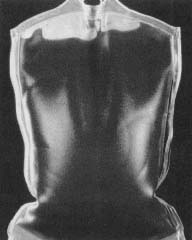 A method of preserving red blood cells for up to 21 days with acid citrate dextrose was developed in the 1940s. African-American surgeon Charles Richard Drew studied in depth a way to preserve and store blood ready for instant use. He discovered that plasma could be processed and reserved for a long time, and transfused without regard to blood type or matching in place of whole blood. Drew established blood banks in England and the United States during World War II (1939-1945). These banks saved thousands of lives by making blood transfusion available to the wounded. Today, blood transfusion remains a widely used and critical medical procedure. After World War II, methods were developed for separating the various constituents of blood. As a result, in addition to whole blood, a patient may receive "packed" red cells, granulocytes (white cells), platelets, plasma, or plasma components. Both natural and artificial blood substitutes are also used. Perhaps most serious of the remaining risks of blood transfusion is the possibility of transmitting disease via the donor's blood. Of special concern is the transmittal of the HIV virus and hepatitis. For this reason, donated blood is carefully screened. This is some interesting information. I love this article it is helpful to know about these things. that is very nice but what i really want to ask about is,in blood transfusion why wbcs are not attacking recipient tissues? FROM THE book that I read it is said that in blood transfusion, the blood that is given is whole blood if both the recipient and the donor have the same blood group (e.g. is Blood type B to blood type B) since they both have the same antigen and antibody(WBC)on the blood .. but in cases like blood type O to blood type A only the RED cells that is given to the recipient because the antibody present on the donor's blood is on the serum. if blood is given to the recipient contains the donor's serum, the antibodies of the donor will attack the red cell of the recipient and will cause an intravascular hemolysis. Also, nowadays, blood transfusions are depleted of WBCs. Blood transfusion is done through artery or vein, Blood draw from vein and transfused(Recipent) through artery? Is animals blood can transfused in human?? If yes, why ,if not why? please tell me the reason..
can blood transfusion be used when you have swelling of the body that won't go down?